Update: Since 2013, Odd Duck is now a brick-and-mortar location. My visit to Odd Duck was part of the Central TX BBQ Run. While the primary reason we came to Austin was the wide variety of excellent barbecue joints, it’s important to note that Austin has a very healthy and vibrant non-barbecue food scene as well. In particular, Austin is ahead of the curve with the current food cart trend, with all sorts of energetic chefs piling cooking equipment and refrigerators into all sorts of food carts, converted airstream trailers, vans, and the like. They are pretty much everywhere in central Austin now, it seems that a large fraction of vacant lots, parking lots, sidewalks, and curbsides now host food carts. Heck, most of them now feature groups of carts. Pretty much every fare that can be sold from a truck is sold from a truck, from burgers, to organic meat, to vegan wraps, to chicken n’ waffles, to tacos (where the whole food cart craze really took hold), to, well, just about anything. There’s even an iPhone app for tracking them (along with facebook and twitter). Despite already gorging ourselves earlier in the day at Kreuz Market (and, remember, several members of our group had already been to another three BBQ joints before that), we still had enough stomach space to do a little food-carting. So after consulting various food cart lists, we settled on 1219 South Lamar, a modest court hosting Trey’s Cuisine, Gourdough’s Donuts, and Odd Duck Farm-to-Trailer. I’ll start with the last of these. 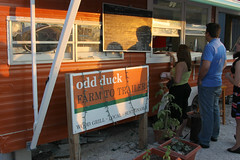 Odd Duck Farm-to-Trailer is a food cart run by local chef Bryce Gilmore, and focuses on bringing food from local farms to the masses via this little trailer. The menu is almost entirely locally-sourced food, ranging from locally-raised quail with sweet potato salad, to turnip and rutebaga salad, to grilled veggies, to pork belly sliders. You get the drift. The idea is moderately-sized plates with high-quality local ingredients, cooked well. 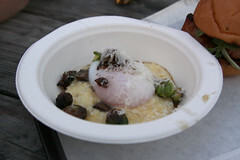 After perusing their menu, I settled on two items, parmesan grits with a soft boiled duck egg, mushrooms, parmesan, and brussel sprouts, followed by a pork belly slider served up with aioli and homemade kraut. First up was the parmesan grits. First of all, Odd Duck got the foundation of the dish perfect, the grits were creamy and smooth, but with just enough large grainy bits to make it clear that it’s grits you are eating, and enough cheese to give it some extra substance, without being too salty. The duck egg perfectly cooked: the whites just barely set, and the yolk perfectly creamy. Add in a few fried mushrooms and brussel sprout, and it was a perfect little dish (and I don’t usually like brussel sprouts). 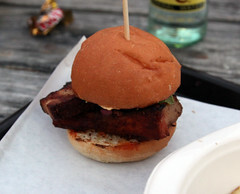 The pork-belly slider was also quite excellent. Served up as a perfectly-seared and marinated slab of pork belly from Richardson Farm, you can barely call this thing a slider, since it was a very substantial piece of bell. Topped with a pleasant aoili and a subtle kraut, the resulting flavor combinations were pleasant. The pork was sweet and tangy, with hints of cumin and pepper. The kraut gave some crunch and sweetness without overwhelming the pork, adding just a slight sour note. And the aioli gave it a bit of moisture and a bit of garlic tang. Overall, this was a very well assembled little sandwich, with perfectly balanced spices. The slider showed that this place had earned their good reviews. Other members of my group enjoyed their rutebaga salad and their quail, so it’s obvious that Odd Duck has their act together. This was certainly a perfect way to start our Austin food court experiences. Prior to starting our 21.7 mile march through the various neighborhoods of Boston, we needed a place to have a breakfast, meet up with other hikers, and get a good start to the day. Luckily, only about 100 feet away from the Savin Hill T station is McKenna’s Cafe. A cozy little cafe (note to others: we showed up at 7am to a near-empty cafe, but those showing up later on a Saturday, I’d expect a wait, the place is pretty small), it fits well into the neighborhood. Savin Hill is a surprisingly quiet and mellow corner of Dorchester (and, indeed, even several of my Boston friends mentioned that it was one of those T stops they’ve never gotten off at), and this is the exact sort of cafe you expect in a neighborhood like this. Walk in, get greeted by the staff, and quickly get seated with some coffee to peruse the menu.